CLE Azabache 50 x 5 (TAA Exclusive) – apologies for the blurring of the holographic portion of the band. Exclusive cigars for the TAA are nothing new, but over the past few years the number of offerings offered per year has grown quite large. 2016 included ten new limited offerings, six on-going exclusive offerings, and the event-only La Flor Dominicana TAA 48 Celebration Limited Edition Maduro. This brings the total cigars for 2016 available to TAA members to seventeen. As mentioned, in 2015, CLE released a TAA Exclusive Series offering with the Asylum Nyctophilia Maduro. The Nyctophilia has since become a regular production offering in the Asylum portfolio. Eiroa and CLE are not known for “one and done” cigars, so it will be interesting to see if the Azabache follows the Nyctophilia’s lead and eventually becomes an on-going regular release. 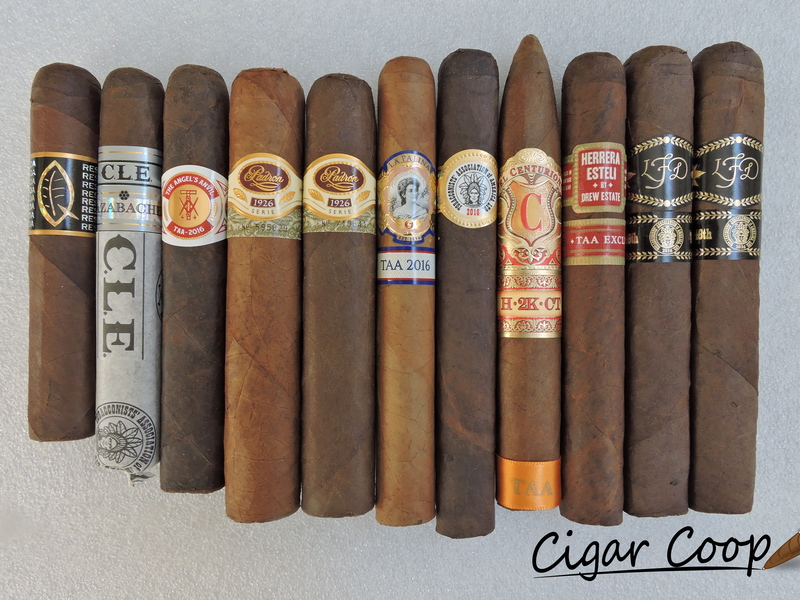 For completeness we list the two cigars that CLE has released for the TAA. The dark wrapper is a maduro from Mexico. The blend is not your typical CLE blend as it also features tobaccos from Honduras, Nicaragua, and Peru. The cigars are produced at Eiroa’s El Aladino factory in Danli, Honduras. As mentioned the CLE Azabache is the one offering in the new 2016 TAA Exclusive Series cigars to be featured in multiple vitolas. Each of the three sizes is box-pressed. The cigars are offered in 25 count boxes. 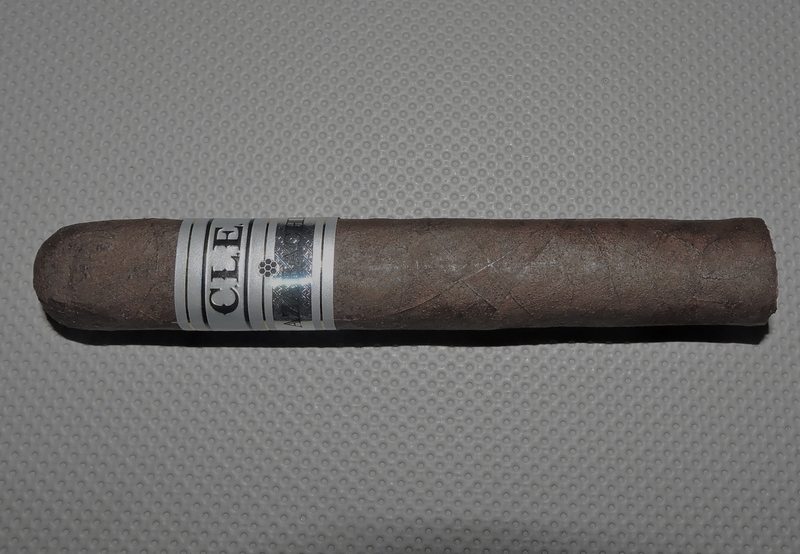 The Mexican Maduro wrapper of the CLE Azabache 50 x 5 has a dark roasted coffee bean color. There is a light coating of oil not he surface. I found this cigar to have a smooth service. Most of the wrapper seams are well hidden and any visible veins are on the thin side. I found the box-press to be firm with a soft Cuban press style. CLE Azabache 50 x 5 (Paper removed) – apologies for the blurring of the holographic portion of the band. The band to the CLE Azabache is silver with black and gold pin striping. Prominently on the center of the band is the CLE logo in black font. The lower portion of the band features a rectangular holographic background with the text “AZEBACHE” in black font. There is tissue paper covering the footer and extending up to the bottom of the band. The tissue paper is white with black font. On the tissue paper is the Tobacconists Association of America logo as well as the C.L.E. Cigar Company logo. The text ‘TAA Exclusive” also appears on the tissue paper. The use of the tissue paper is in place of cellophane to protect the cigar. Christian Eiroa mentioned on Episode 150 of Stogie Geeks that he does not like cellophane, thus the use of the tissue paper in place of it. After first removing the tissue paper from the CLE Azebache 50 x 5, I went with a straight cut to remove the cap. Once the cap was clipped, I commenced with the pre-light draw. The cold draw produced some notes of chocolate along with a touch of cedar and a touch of floral. Overall I considered this to be a satisfactory pre-light draw. At this point I was ready to light up the CLE Azebache 50 x 5 and see what the smoking experience would have in store. 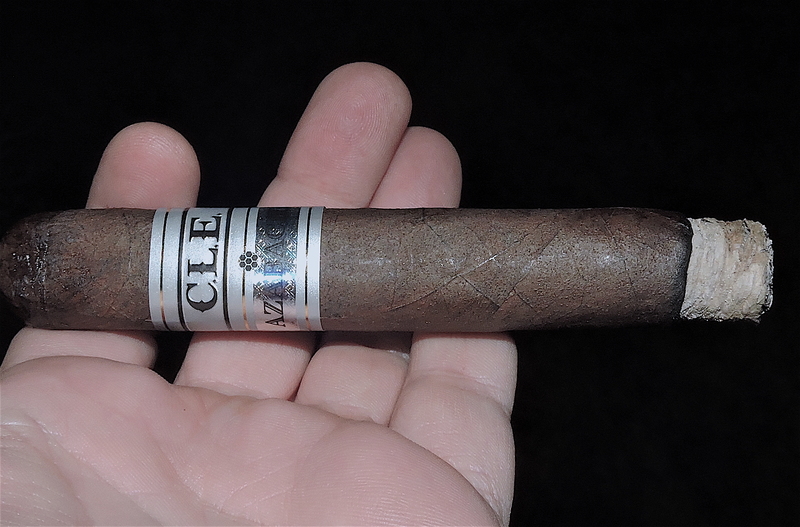 The CLE Azebache started out with a mix of chocolate, maduro sweetness (something I define as a cross between natural tobacco flavors and dried fruit), and cedar notes. The chocolate and maduro sweetness moved into the forefront while the cedar notes went into the background. The chocolate and maduro sweetness alternated in intensity throughout the first third. Meanwhile I detected an additional layer on white pepper on the retro-hale. The second third of the CLE Azebache 50 x 5 saw the cedar notes move into the forefront joining the maduro sweetness. There was now a black pepper note present on the tongue (providing a nice complement to the white pepper on the retro-hale). This black pepper gradually increased through this segment of the CLE Azebache. The chocolate notes were also primarily background note, but during this stage of the smoking experience did float in and out of the forefront from time to time. As the CLE Azebache 50 x 5 moved into the last third, there was much more in the way of spice. The cedar notes were grounded in the forefront while the pepper notes were a close secondary note. There was still a touch of maduro sweetness and chocolate. This is the way the flavor profile of the CLE Azebache 50 x 5 came to a close. The resulting nub was firm to the touch and cool in temperature. In terms of burn, the CLE Azebache 50 x 5 scored quite well. The cigar had no difficulty maintaining a straight burn path and the burn line also remained relatively straight. This was a cigar that didn’t require an excessive amount of touch-ups. The resulting ash was gray in color and was on the firm side. The burn rate and burn temperature were both ideal. The draw also performed quite well. This was a draw that was more on the open side, but was not a loose one either. Overall, this was a low maintenance cigar to derive flavor from. In terms of strength, the CLE Azebache 50 x 5 started out medium. There was a slight increase in strength along the way, but the cigar never crossed the line into medium to full territory. The body of the CLE Azebache also started out medium, then gradually increased during the first half. By the second half, I did find he Azebache moved into medium to full territory. In terms of strength versus body, I found both attributes balanced each other nicely in the first half. As the body increased in the second half, the body would have a slight edge. If you have read many of my reviews of the TAA cigars, you have seen I have been very critical that there now are too many cigars in released the TAA Exclusive Series. While on paper it sounds like it is a great idea to have a large selection of cigars in the TAA, it has less to a series that has become somewhat diluted and thinner in terms of offering those “special” cigars. The CLE Azebache is one of those cigars. On its own, it’s a fine cigar and I enjoyed it. However it falls short of being that special cigar I would expect in a TAA series. 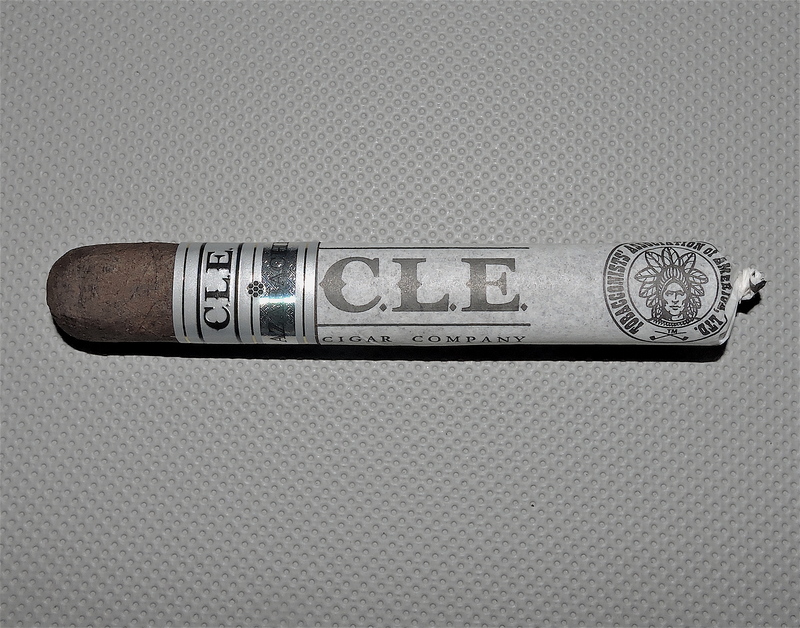 The CLE Azebache 50 x 5 is a cigar that had good flavor and excellent construction. It just lacked that intangible I was hoping to get from something in the TAA series. This is still a cigar I’d recommend to an experienced cigar enthusiast. It’s a nice cigar for a novice to “graduate” to something medium / medium plus. As for myself, this is a cigar that I would smoke again – and it’s worthy of picking up a five pack.